A seismic wave of change took off in 2013 across the European Unions’ telecommunications markets. The formation of two distinct digital Europes is on its way: on one side there are progressive European digital economies with genuinely competitive smartphone connectivity markets like the UK and France and on the other side there are protected oligopolies like the EU’s largest economy, Germany, where competition can be described at best as friendly. 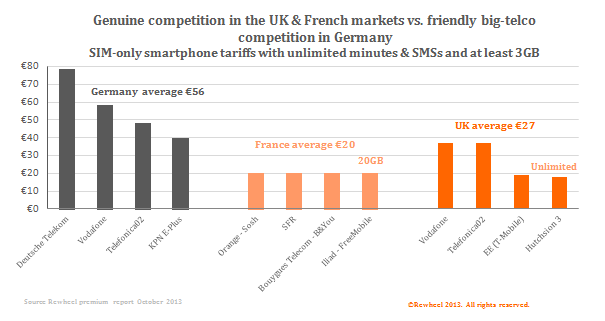 Triggered by Iliad’s December 2013 announcement to offer 20GB of 4G for €20 in our flash report we present the latest price points for smartphone connectivity in the French, UK and German mobile markets.